World stocks and oil prices plunged Monday as a global selloff accelerated on fears about the health of China's huge economy. China stocks crashed and all Asian markets suffered major losses. 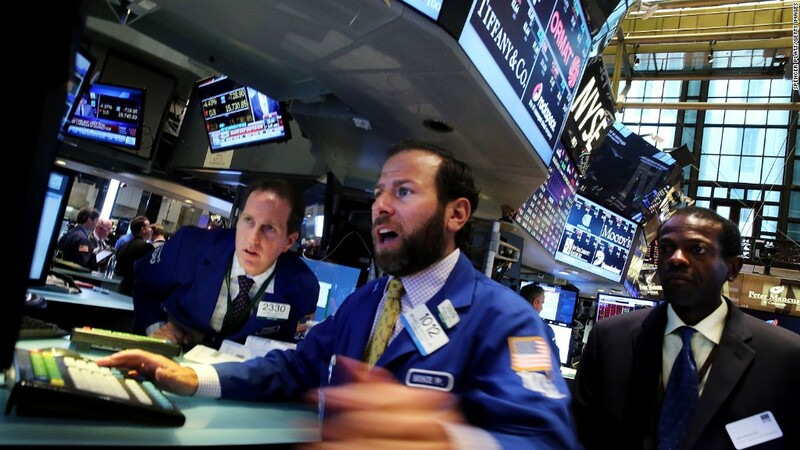 Europe's markets fell by about 5% and Wall Street was crushed at the open. 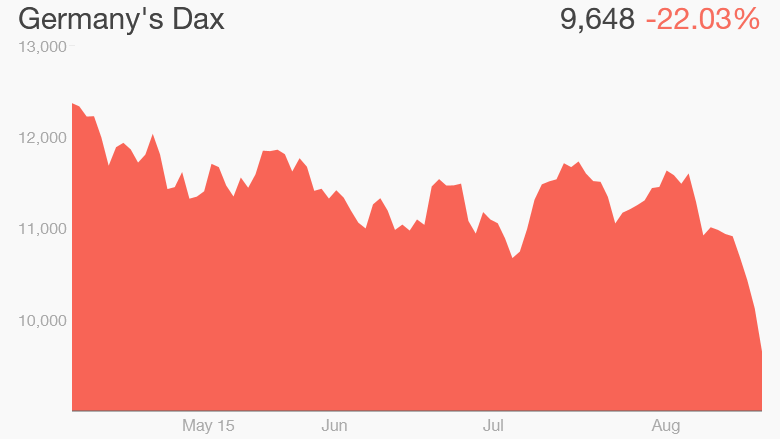 The losses tipped Germany into a bear market -- Frankfurt's DAX has now fallen more than 20% from its April peak, and its gains for 2015 have been wiped out. Europe is China's largest trading partner, and the world's second biggest economy is a vital market for big German companies such as Daimler (DDAIF), Volkswagen (VLKAF) and Siemens (SIEGY). Worries that China is stumbling also trashed commodities. Oil slumped more than 4% to a new six-year low below $39 a barrel. China's benchmark Shanghai Composite index declined 8.5%, wiping out all gains made this year. Many companies, including some large state-owned firms, fell by the maximum daily limit of 10%. The index is now down 38% since its June peak. In Japan, the Nikkei closed down 4.6%. Stocks in India suffered their biggest fall in more than seven years. The losses went beyond stocks and commodity markets. Many emerging market currencies -- including Russia's ruble -- tumbled against the U.S. dollar. 1. Concerns that China's economy is slowing faster than analysts had anticipated. 2. Uncertainty over when the U.S. Federal Reserve will raise interest rates for the first time in nearly a decade. 3. The effect of exceedingly cheap oil, which slams exporting countries as well as drilling companies. Concerns mounted after a key gauge of China's manufacturing activity tumbled to its lowest level in 77 months. This week, investors will get a closer look at Chinese imports, vital for many countries that rely on China as a trade partner. The Dow plummeted by more than 1,000 points last week -- its worst five-day run since 2011. The Shanghai Composite fell 11.5% over the same period. Analysts at UBS said that central banks stood ready to provide support if sentiment worsens. The dollar weakened against other major world currencies such as the euro, British pound and yen, on speculation that the global market turmoil may push back a U.S. interest rate rise. Many investors and economists had bet on a Fed rate hike in September, something it hasn't done since 2006. But in the Fed's minutes published last week, committee members sent the market mixed messages. A rate hike would increase borrowing costs -- interest on loans -- for companies in emerging markets. It would also make American debt more attractive to investors, which means they could dump emerging market debt. And then there's oil. A year ago, a barrel of oil cost about $100 -- now it's trading near $40. Oil is a lifeline of economic growth for many developing countries, which are also seeing their currencies lose value because of their economic exposure to China.